TEHRAN (IRNA, Reuters) — Gunmen who opened fire at a viewing stand in the southwest of the country carried out one of the worst attacks ever against the elite force on Saturday. 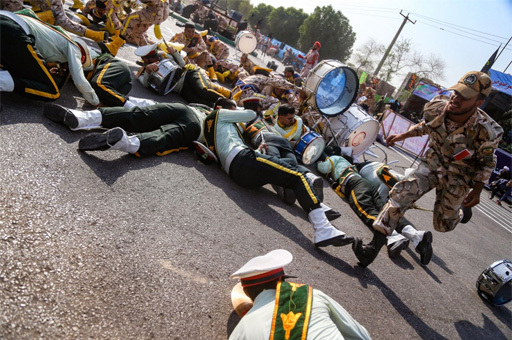 Gunmen disguised as soldiers attacked an annual Iranian military parade Saturday in the country’s oil-rich southwest, killing at least 25 people and wounding 60 in the bloodiest assault to strike the country in recent years. The attack in Ahvaz saw gunfire sprayed into a crowd of marching Revolutionary Guardsmen, bystanders and government officials watching from a nearby riser. Suspicion immediately fell on the region’s Arab separatists, who previously only attacked unguarded oil pipelines under the cover of darkness. The city of Ahvaz, where the attack took place, is the capital of Khuzestan, a region bordering Iraq where the majority of Iran’s Arab minority lives. An Iranian ethnic Arab opposition movement called the Ahvaz National Resistance, which seeks a separate state in oil-rich Khuzestan province, claimed responsibility for the attack. So did Islamic State, who also claimed responsibility for a 2017 attack at the Iranian parliament and the mausoleum of Ayatollah Khomeini, which left 18 dead.